Alaska and the end of the road. 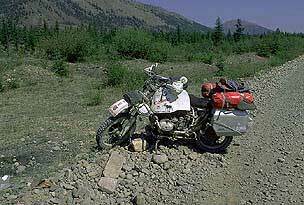 To continue our travels to Siberia, there was only one way to get ourselves and bikes over the Bering Sea. By airplane. We had tried Alaska Airlines, but when we mentioned that we had a couple of bikes in our luggage, their red flag went up. 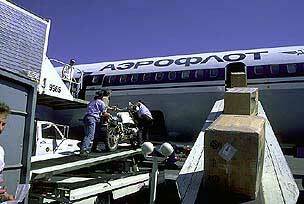 The Russian carrier, Aeroflot, came to our rescue. They had no problem taking us for a ride as long as we had plenty of green dollars. 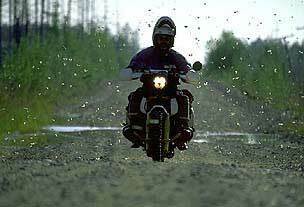 Imagine, if you can, that you are riding along on a fairly good surfaced gravel road.... speed - let’s say about 40-50 m/hr. Then all of a sudden you feel that the front end is loose...the most logical reason, you assume, is a puncture. But then magically, the handlebars are no longer attached to the bike. Your only connection to your 500 lb. motorcycle is via a clump of wires which disappear somewhere into the bowels of your machine! Aack! That was exactly what happened to me on this lonely stretch in Siberia. Fortunately I was wearing full protective clothing so the crash only left me with a few bruises. Andy Goldfine, founder of Aerostich Design, was my companion for nearly five months when we toured through Far East Asia in the summer of 1996. We had good days and we had bad days. Some times the road was so bad that we really wondered about our sanity insetting out on this journey. Other times there were more mosquitoes attacking us than anyone can imagine. But most of all we had good riding days. Here, butterflies, having a drink, are scared up by the bikes. We had come to the worlds largest campground, Mongolia. 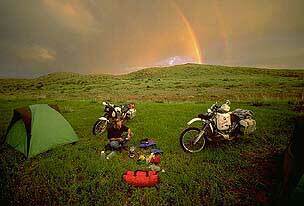 Riding a motorcycle and camping wild doesn’t get any better than this. Huge grasslands and no people. Except for Ulaanbataar, the capital of Mongolia, and a few other towns and villages, most people lived in their Yurt. Having lived in a tent for over 10 years, I felt right at home. 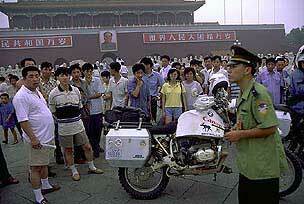 "No, you can not go to Tiananmen Square with your motorcycle, not even with your guide". But we did it anyway, alone, one early morning before the police started their watchful day. It was a close call though, as you see from this picture. One early-bird tourist policeman came running over to us at 5:30 am and advised us that we better get going or we would be in big trouble. So we did, but that was only after taking a few pictures to proof that we did ride to Tiananmen Square. The Forbidden City with huge portrait of Mao is in the background. 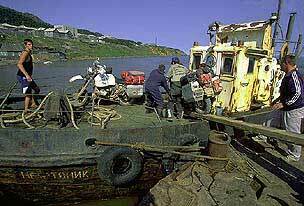 The only way to get from mainland Russia, Siberia, to Sakhalin Island is by boat or plane. We had luck with us and were helped by the local police chief. He arranged for an old KGB patrol boat to take us across the 7 km. narrow strait from Lassarew. The only problem was that their was no road where we landed on Sakhalin Island... but that is another story.